Here’s what I want to say about my Dinosaur Tarot Reading – those darn dinos are amazingly perceptive. Small brains??? I don’t think so!! I was at an event this weekend where I saw a woman sitting on the floor with a suitcase full of plastic dinosaurs. 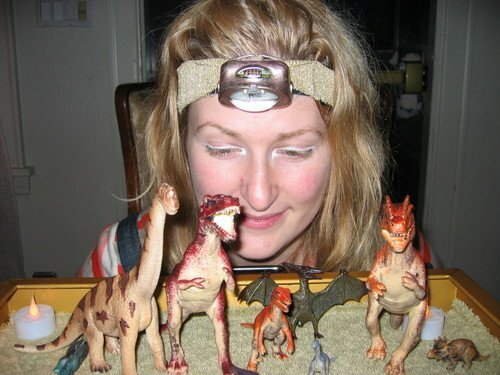 She was offering tarot readings, only this reading had nothing to do with cards – it was all about the dinosaurs. This was too intriguing to pass up, so I took a seat in front of the suitcase and asked if I could focus the reading on my passion – writing books for animal lovers. I choose three dinosaurs, each representing different aspects of my life and work. 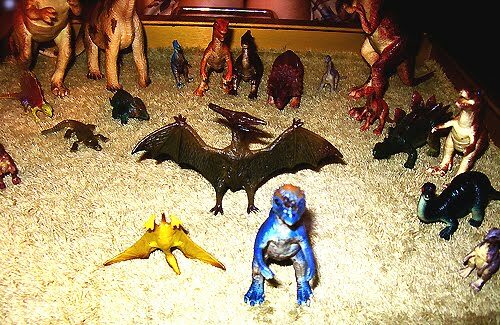 Then Grey Anne, the woman who keeps these plastic figurines employed, went on to offer insights and guidance direct from the dinos. All I can say is WOW – was this fun…and very helpful! Although I’m going to keep what I heard to myself, I CAN say that what the dinosaurs shared will remain with me forever. 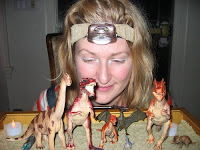 You can learn more about Grey Anne and her dinosaurs at www.dinotarot.com. Time to go watch Jurassic Park. It really was fun, Bernadette. I hope it catches on back east! The dinosaur tarot reading was new to me, but it sure was fun!! The tarot offers guidance and help to empower to take responsibility for your decisions and make the changes in life you want to make.